I am also trying some of the Clos La Coutale I mentioned in my previous post. Very herbaceous… taste some mushroom… strangely, get an avocado sensation. High acidity, more than I remember from last time. Might need to open up a little. Not unpleasant, though–still pretty good. Done. I uncovered the pan, turned up the heat, and added chopped kalamata olives. I also heated up some Trader Joe’s polenta (from a tube, I know, but still good in a pinch). 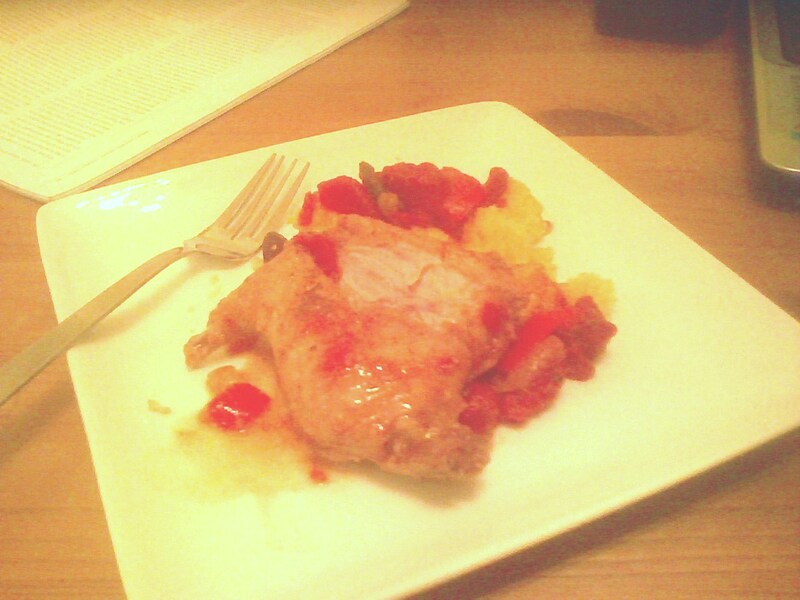 I plated the food: a mount of polenta, then a piece of rabbit, then a ladle of vegetable stew. I brought a plate for myself and my roommate out to the dining room table. Then, the moment of truth: ABSOLUTELY DELICIOUS! The vegetables and herbs married well together, and the rabbit was sublime, very tender and flavorful. Rabbit, I realized, actually tastes and feels a lot like duck. One thing about rabbit is that its bones–well, are like a mammal’s. Four legs, vertebra, etc. It’s not like eating a piece of chicken. My roommate–a recovering life-long vegetarian–had a bit of trouble with the bones: otherwise, the rabbit was good, he claimed. 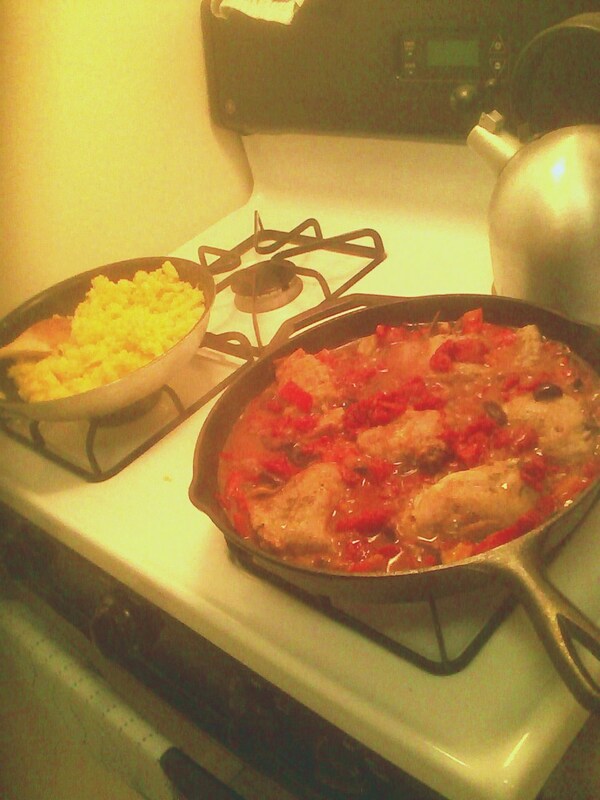 I would definitely make this dish again. I would consider making it with chicken breast for a “safer” dinner, but I would strongly recommend trying this recipe with rabbit as called for. The wine was decent–it didn’t open up as I had hoped it would. It tasted a bit thin, actually. Luckily, I’ve experienced the wine a few times before, and this bottle was probably an anomaly. Oh, the dangers of drinking imported French wine and cooking strange meats! You went home and did things to a rabbit I can’t even imagine. I picked up a burrito and skimmed a Contracts hornbook. Not sure who wins here, but it wasn’t the rabbit. Looks tasty. And hey, Polenta isn’t that hard to make from scratch! 🙂 Good luck with the exam prep – hopefully your first set doesn’t count. This foods are really sweetest. Its looks wonderful.